As a fairly new resident to the Seattle area, I haven’t gotten a chance to experience all the city has to offer. 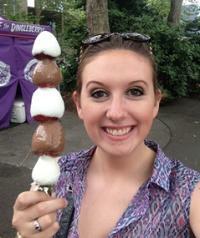 I was interested in checking out the Bite of Seattle, and everyone I asked about it said it was a “must do.” I rounded up my friends and decided we were going to check it out. 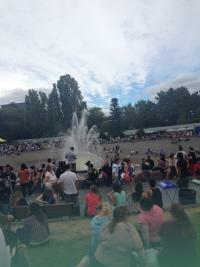 So with open minds and empty stomachs, the four amigos ventured to Seattle Center. 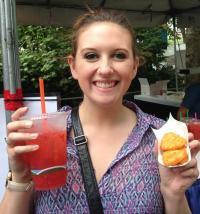 The first thing I saw was deep fried mac and cheese, which I knew I had to try. I was given 4 triangles for $3.75, and I added on strawberry lemonade to make my total $7.50. It was love at first bite. It was fresh, hot and greasy; everything that is pure and good in this world. The mac and cheese taste wasn’t lost to the deep fried outer layer and the crispiness was complimented well by the inside gooeyness of the mac and cheese. It only took me about 2 minutes to realize I had eaten them all without offering my companions a sample. Whoops! 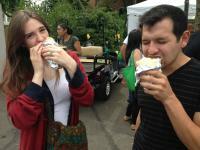 Luis and Savanna ventured inward to the festival and were happily surprised at the great gyro stand they found. They commented the tzatziki sauce was the best they ever had. Fernando found a great booth that sold Philly cheesesteaks with chicken (Philly cheeschicken?). 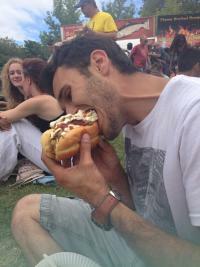 However you want to say it, he said it was absolutely delicious. The meat melted in his mouth and was so savory and tender. It was just messy enough to be funny too! 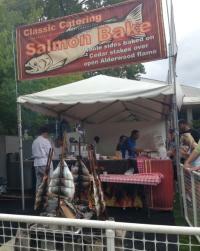 Located right next to the Philly stand was the Classic Catering booth and they were cooking whole sides of salmon on cedar stakes over an open Alderwood flame! The aroma spread throughout the whole park and it all looked divine; I would’ve tried it if I had a taste for seafood. But the line for the salmon was quite a ways back so I can only assume it was wonderful. Rounding off the afternoon, I stopped at Shishkaberry’s for some white and milk chocolate covered strawberries. Luckily for me none of my comrades were craving anything sweet so I got to finish it all by myself. All in all, Bite of Seattle was spectacular. Every vendor was exceptionally nice, the lines moved quickly, the music was great, and of course, the food was out of this world and reasonably priced! I’ll definitely be returning next year! For those of you who couldn’t make it, you missed out on a great time and some well worth it heartburn!